Geoffrey Castle's reputation for excellence in event entertainment has made him one of the most in demand performers in the United States, and he is often flown far from Seattle to bring his magic to events from Taiwan to Vienna, California to Nashville, Kansas to Cancun and beyond. He is the only performer to have been featured at the Microsoft Star Awards Gala for five straight years. 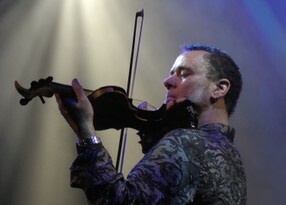 Geoffrey Castle is a pioneer on the electric six-string violin. From his beginnings as a street musician in New York City and Paris, he rose to play in the Tony Award winning Broadway production of M. Butterfly. 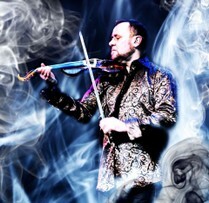 Whether on stage with members of YES, Heart, Queen, or in the Broadway production of M.Butterfly, or playing solo on stages across the US and Europe, Castle's showmanship and command of his instrument always leave audiences roaring their approval. A bandleader and solo artist, Geoffrey Castle's music been featured on radio and TV across the US, and his violin work has graced multiple movie and TV soundtracks. 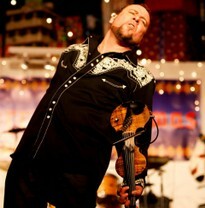 Castle's diverse appeal is reflected in the huge variety of formats that have featured him: NPR, Hard Rock, Country, and Smooth Jazz stations have all featured Castle's genre-defying fiddling.